Electric dog fences are both a safe and affordable solution to keep your dog safe at home whilst allowing them freedom to roam and play within your properties boundary. In recent years due to their flexibility and effectiveness electric dog fencing has become increasing popular for cats as well. It goes without saying that electric dog fencing is not for everyone. It’s important to fully understand how the fences work and weigh up the pro’s and cons between electric dog fencing and traditional fencing. There are two types of electric dog fences, wired and wireless. The most popular and effective are the wired systems. The fence consists of a transmitter box, a boundary wire and a small computer collar which is worn by the dog or cat. The transmitter box is installed on site and the boundary wire is connected to the transmitter box. The is buried around the perimeter of the property and wire carries the harmless low-level radio signal around the boundary. The pet wears a computer collar that emits a warning beep followed by a mild stimulation (similar to a carpet shock) when he gets too close to the designated area. 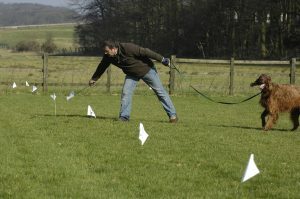 The no go area for the electric dog fence is marked with some temporary training flags to assist the pet with a visual. The dog fence Installer trains the pet to understand the avoidance area. With the wireless dog fence there is no boundary wire. The transmitter is located centrally around the area to be fenced. The transmitter sends out a circle of signal from the base station. Unfortunately, wireless dog fences are prone to false activation and are only effective for flat properties with no obstructions for the signal. 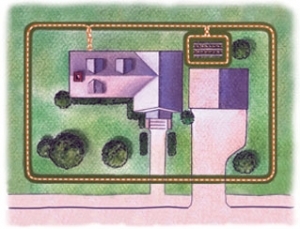 When it comes to the electric dog fence there are two types — wireless and in-ground. Even though they work in different ways, both systems consist of some sort of base unit that creates a hidden boundary around whatever area you want to contain your dog in. Read more about wireless dog fences here. Price – an electric dog fence is far cheaper than a traditional fence and gate. Dogs and cats can be allowed to roam freely – not kenneled or caged and exhibit natural behaviour. Dog or cat cannot jump over or under and signal is 360 degrees. The driveway is protected so no worries about an open gate or slow electric gates. Can be installed on terrains that are not suitable for traditional fencing. Can be used through streams, along tow paths, woodland, steep slopes and areas with planning restrictions. Quicker to install than a traditional fence. Up to 10 acres installed in 1 day. Electric dog fencing does not restrict views. Can be used to keep pets out of areas – pools, play areas, flower beds. Easier to maintain than a traditional fence. Can be moved from house to house. Electric dog Fence collar also works indoors to keep pets out of rooms or off furniture. Does not keep other dogs, cats or wildlife out of your garden. Not recommended for aggressive dogs as with wireless or electric dog fencing there is no physical barrier. Batteries in the dog’s collar must be changed every 3, 6 or 24 months (reputable Companies should offer an automatic renewal programme). If the power goes down the electric dog fence can go down – look for a system with a battery backup. Not suitable for dogs in whelp or very old dogs. Customer must assist with training so can take dogs up to 10 days to fully learn the fence. Must make contractors aware of buried boundary wire if digging or landscaping to avoid damage. Electric dog fences have been available in one form or another for over 40 years. Recent advances in technology have now brought these fences to another level and items listed in the “cons” list are now easily avoided with the higher specification systems. In 2018 DogFence launched their new enabled fence. This new generation of electrical dog fencing gives the owner real-time information and notifications regarding the status of their system. The fence offer a new 2 way communication between the electric dog fence collar and the base station through an app. Take a peak at our video which explains all the amazing features in the Smart Fence here. Send out an email alert regarding the battery level. Activity tracker for each pet through the app. These email alerts are also sent out to the DogFence office so we can contact the customer to book a service visit or arrange a replacement battery. If you would like to know more about our Smart Fence or our other fences please contact us on 01628 476475 or email info@dogfence.co.uk. With new legislation on the way, the question everyone is asking is: are electric dog fences illegal in the U.K.? The straight answer is electric dog and cat fences ARE LEGAL. Electronic dog and cat fences are completely legal in the U.K.
Why the confusion? Electric dog fences (which can also be used for cats) were included in the government consultation into electronic training aids for pets through a lack of understanding of the subject. 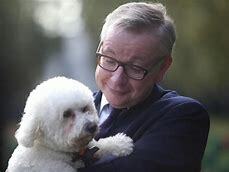 However, Michael Gove, an ardent dog-lover who is heading up the legislation, realised the error, and ensured that electric dog and cat fences were not included in the new law due later this year. Thankfully DEFRA have realised that to make dog fences illegal would comprise the safety of both dogs and cats. Michael Gove declare containment systems safe. So whether you need an electric dog or cat fence because you have a tricky boundary, escapee pet or simply need to keep your dog or cat within a specific area of your garden or home, breathe a sigh of relief and read on for a clear and easy explanation of why dog and cat fences are still legal in the U.K.
We all know that making dog and cat fences illegal in the U.K. would be a complete disaster because they save lives. However, civil service ignorance meant that when the department set out to consult on the legality of electronic training collars, they mistakenly included electric containment fences in the mix. Any animal lover knows that electronic collars and containment fences are two completely different things. So when experts like Ward Chapman, DogFence.co.uk founder (who has been in the business for over twenty years), were invited to consult on the proposed legislation with The Department for Environment, Food and Rural Affairs (DEFRA), they immediately pointed out the error. In fact, it was the experts and pet-owners that had to remind the government that in previous years DEFRA had themselves, excluded electric dog fences for pets from their past research. Thus, began a series of high-profile requests for the distinction to be made between electronic training collars and containment fences. Ross Thomson, Member of Parliament for Aberdeen South, was unaware that the government were consulting on making containment fences illegal too. Thomson’s request had referred to the electronic training collars, not containment fences. When confronted by the Countryside Alliance in March 2018, Ross Thomson was quick to clear things up, stating that he had no problem with containment fences. With the backing of dog charities his issue was with electronic training aids. Luckily, knowing how containment fences work, Michael Gove, a dog owner himself, stepped in and removed containment fences from the legislation. So your pets can stay safe and you can remain hassle-free, because electric dog fences and cat fences will not be illegal later this year. What did come out of the consultation was a need for the government to ensure that containment fences across the U.K. are high-quality products. Most importantly it was noted that they should be installed properly by professionals along with proper training delivered to owners during installation. So from later this year, it will be a requirement that any electric dog fence or cat fence is installed by a professional, and full training is given to both the pet and owner. At DogFence.co.uk we have been professionally installing high quality, modern and safe hidden fences for over twenty years. With full training for owners and a lifetime warranty included, we have been ahead of the game for years. Watch our video to see how we work – Who are DogFence.co.uk? Firstly, the word “electric” is incorrect – these fences do not emit an electric shock. A lack of understanding over how dog and cats fences work can mean that containment fences for pets can be classed as the same thing as a dog training collar. However, as recent events have shown, the two are completely different. There are many different types of training collars that are used by trainers and owners for dogs, these include: shock collars, spray collars and sonic collars. The controversial ones are the electronic training collars. However, many dog training tools inc; leads, flat collars, head halters, and even harnesses can harm a dog. All training tools need to be used correctly. It goes without saying that vets will have come across dogs that have been injured by incorrect use of a training tool. I would hazard a guess that very few have come across an injury from a an electronic training collar though. Why do people use training collars? Although many dog trainers rely on positive reinforcement methods, there are some dogs or occasions where some dogs need negative training for a particular situation. In these cases where a reward is not sufficient or reward based training has failed they may choose to use a negative response as a learning tool. There are many myths that surround the use of electronic training collars, so let’s take a quick look at the facts. Electronic training collars are sometimes referred to as “shock collars”. You may be horrified to hear that they do exist, however, with around 170 different types of electronic collars available around the world, here in the U.K. we only have five that are actually in use. Each of the five approved electronic collars, meet British and E.U. safety and protection requirements for animal safety. The standards that we use here in the U.K., and across the European Union, were drawn up by The Electronic Collar Manufacturer’s Association (ECMA). One of the biggest myths is that training collars are wired up to the mains electricity! Clearly this is not true. 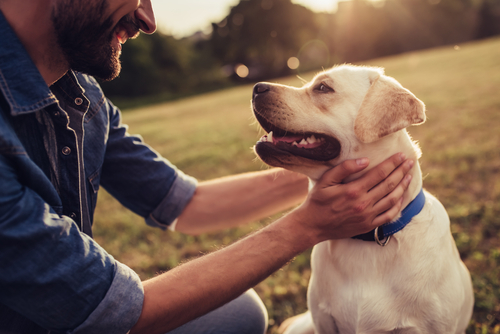 When you use an electronic collar, the dog receives a “mild stimulation”, which distracts them from the hazard that the owner wants them to avoid. The stimulation is to gain the dog’s attention. A good analogy would be “tapping the dog on the head to say – excuse me I’m talking to you!”. These collars can keep the animal safe by preventing them from chasing livestock and assisting with recall and other training issues. They do not as reported cause them pain, fear or distress. Instead they keep the animal protected, and in some cases avoid the animal being re-homed or shot. Some observers suggest that because the collar is operated by humans, it may be open to abuse. However, the reality is that there have been no convictions in the U.K. of animal cruelty resulting from electronic training collars or electric dog fences. Indeed, the cost of a training collar would make it a cruel and long-winded choice for a means to abuse a dog! How are dog containment fences different? Why is a containment fence different to a training collar? The dog or cat is in control. A containment fence is a passive Pavlovian system governed by the animal’s own behaviour. A containment fence collar releases a small static impulse if the dog or cat enters an exclusion area. The impulse mimics the ‘nip’ that an adult animal would give its young to alert them of a threat. Before the impulse is given the collar gives a warning “beep”. The pet decides whether to continue or retreat. In the initial training phase the exclusion zone is marked with temporary marking flags. The impulse itself is a secondary measure because during the training delivered by professional staff, we at DogFence.co.uk will train the dog and owner. We use use vocal commands and visual training flags to understand that the areas in question are out of bounds. In this way, the impulse from the electric dog fence should be minimal and only in the training phase. Once trained it is rare for the pet to activate the containment fence collar. At DogFence.co.uk, our customers report time, after time that because of our training, their pet stays away from the fence thus the impulse from the fence is never needed. It is merely a precautionary measure. The pet is firmly in control. Watch our video of Lionel Demonstrating the fence! Is there any research that says that electric dog fences and cat fences should be illegal? No, there are no studies that suggest that these fences should be illegal. Indeed, research by Professor Mils at Lincoln University proved that containment fences are a safe and effective way to protect cats from hazards. Why are containment fences exempt from the ban? Once The Department for Environment, Food and Rural Affairs (DEFRA) looked at all of the evidence, they were able to conclude that containment fences were indeed different to electronic dog collars. Further they recognised that containment fences can in fact save lives, enabling cats and dogs to roam freely outside, safe from dangerous roads. To make dog fences illegal would have a negative impact on animal welfare. Why are electric dog fences illegal in Wales if the Government has proved they are safe? With the current furor, it is expected that the Welsh Assembly will revisit their hasty and poorly researched ruling, to separate containment fences and electronic collars. With the original ban rushed through before the consultation was completed, the large rural population in Wales are up in arms. There is widespread call from farmers and dog owners for the review to take place sooner, rather than later. Further support for the Welsh campaign can be found on their Facebook page at: “Save our Welsh cats & dogs from death on the roads”. Thankfully, through proper consultation, here in England we were able to ensure that the distinction was made between containment fences and electronic dog collars. As a result, containment fences are not illegal in England, now, or in the future, with Wales looking to follow suit soon. Although, what you will need by law, is a high-quality containment fence that is properly installed by professionals, along with the delivery of full training for the animal and owner. Naturally we are glad that DEFRA have chosen not to be make dog fences illegal but the confusion has been worrying for pet owners across the UK. We can now put a line through the dark cloud that has been hanging over the fence and continue to offer dogs and cats safety and freedom. At DogFence.co.uk, we are proud to have been installing and training high-quality, modern and safe electric dog fences for over twenty years. For more about how we can help you to keep your dog or cat safe both outside or indoors, call us on: 03450 623 623 or email us on: info@dogfence.co.uk today.